The World Head of the Ahmadiyya Muslim Community and Fifth Khalifa, Hazrat Mirza Masroor Ahmad, was welcomed to the Houses of Parliament by the Deputy Prime Minister and various Secretaries of State and Parliamentarians on 11 June 2013. The Khalifa was visiting Westminster to deliver the keynote address at a special reception hosted by Rt Hon Ed Davey MP (Secretary of State for Energy and Climate Change) and the‘All Party Parliamentary Group for the Ahmadiyya Muslim Community’ in recognition of the 100 Year Centenary Celebrations of the Ahmadiyya Muslim Community in the UK. Prior to the formal proceedings, Hazrat Mirza Masroor Ahmad held private meetings with the Deputy Prime Minister Rt Hon Nick Clegg MP, Home Secretary Rt Hon Theresa May MP, Energy Secretary Rt Hon Ed Davey MP, Shadow Foreign Secretary Rt Hon Douglas Alexander MP, Rt Hon Keith Vaz MP and Siobhain McDonagh MP. The formal proceedings began at 1.05pm with a brief welcome address given by Ed Davey, Secretary of State for Energy and Climate Change. This was followed by short addresses by the Deputy Prime Minister, Nick Clegg, by Douglas Alexander, the Shadow Foreign Secretary and by Theresa May, the Home Secretary. During his keynote address, Hazrat Mirza Masroor Ahmad spoke of the Ahmadiyya Muslim Community commitment to peace and tolerance; he spoke of the importance of loyalty to one’s country as a part of Islamic faith; he strongly condemned the recent brutal killing of a British soldier in London; he absolutely rejected the concept of a violent Jihad in today’s world and he appealed for justice in an effort to safeguard the world from warfare and conflict. The Khalifa continued by stating that throughout its 100 year existence in the United Kingdom the Ahmadiyya Muslim Community had always promoted peace and rejected all forms of extremism. The world leader continued by condemning and rejecting absolutely the concept of a ‘violent Jihad’. He accepted with regret that some other ‘so-called’ Muslim scholars promoted such teachings but said they were entirely wrong and responsible for the formation of various terrorist groups and the radicalisation of certain individuals. Later in his address, His Holiness appealed for mutual religious respect and tolerance. He said that Islam had given the foundation for peace because the Quran taught that prophets of God were sent to all peoples and nations. “It was the Founder of Islam who developed the love of God and the love of His creation in our hearts. It was he who ingrained and established love and respect for all of mankind and for all religions within us. 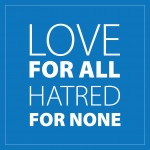 The Holy Prophet(peace be upon him) spent his entire life spreading peace in the world. That was his noble mission. Certainly, there will come a day when the people of the world will realise and understand that he did not bring any teachings of extremism. They will realise that all he brought was a message of peace, love and kindness. The Khalifa concluded by speaking about the critical need for justice in the modern world. He said that he feared current conflicts could escalate into a world war unless all forms of discrimination and inequality were rooted out. The event concluded with a silent prayer and thereafter guests were able to personally meet with Hazrat Mirza Masroor Ahmad. The Centenary Celebrations were attended by 68 dignitaries, including 30 MPs and 12 Members of the House of Lords, including 6 Cabinet Ministers and 2 Ministers. Various media organisations including the BBC, Sky TV and ITV were also present to cover the event.